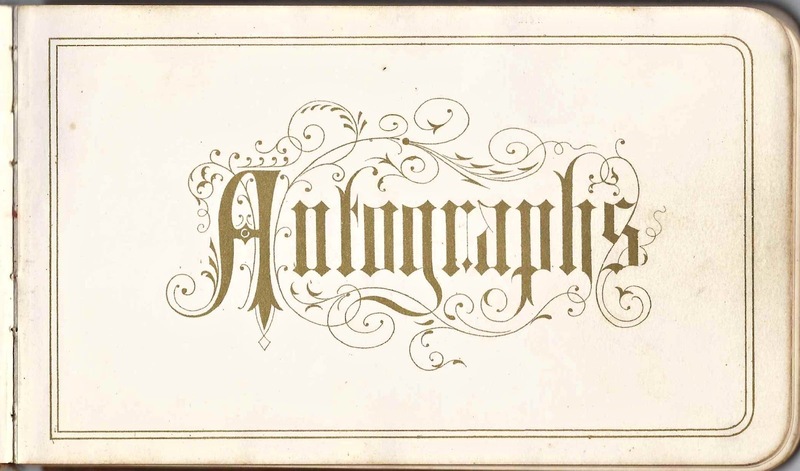 1870s/1880s autograph album that belonged to Sarah Adella Lapham of West Pembroke, Massachusetts. She inscribed her name on the first end paper. See a slide show of images of the pages of the entire album at the end of this post. 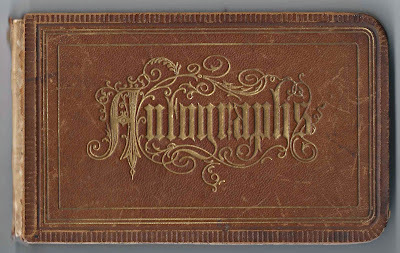 The album is approximately 7" x 4-1/4" inches and contains 79 pages signed by Adella herself, her relatives and friends. Many of the surnames in this album will be familiar to people researching families in Massachusetts, especially Plymouth County. Sarah Adella Lapham was born 20 April 1857 at Pembroke, Massachusetts, the daughter of Samuel and Sarah Keene (Fish) Lapham, who were born at Pembroke themselves. 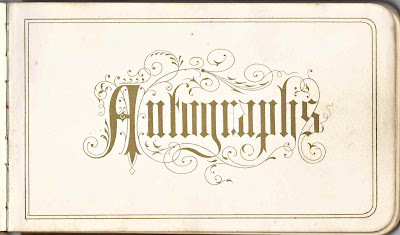 I believe it was Sarah Keene (Fish) Lapham of Pembroke, Massachusetts, who signed a page in her daughter's album on 24 July 1884. Adella's paternal grandparents were Caleb and Molly Polly (Bonney) Lapham. Her maternal grandparents were Levi and Hannah (Bates) Fish. As late as the 1920 Census, Adella was still going by her maiden name, so I'm assuming she never married or had children. Weston P. Alden and Hannah A. Alden of Randolph, Massachusetts, signed 22 October 1879. Hannah Avis (Lapham) Alden was the daughter of Oliver Lapham, brother of Sarah Adella Lapham's father Samuel Lapham. Mercy T. T. Bourne, signed at Pembroke, Massachusetts, in 1878. Mercy Thomas Turner (Tilson) Bourne, wife of James Bourne. Almira K. Bourne of Pembroke, Massachusetts, signed 23 July 1884. William H. Bryant of Pembroke, Massachusetts, signed 1 October 1878. William Henry Harrison Bryant, husband of Almira Jane (Gurney) Bryant who signed the facing page. 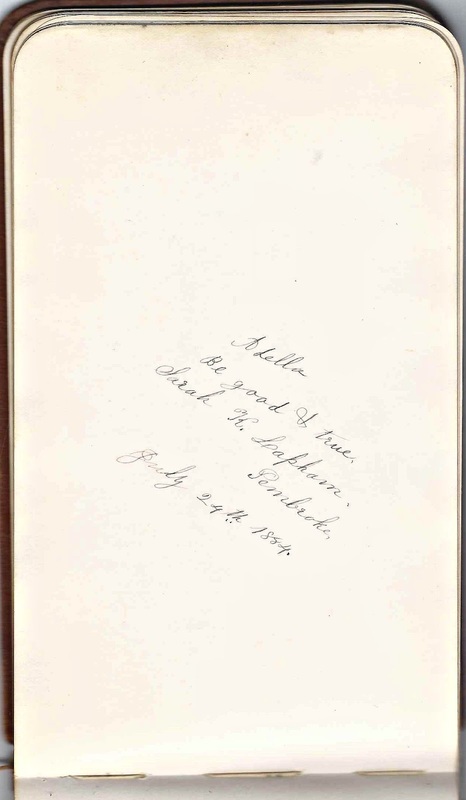 A few years later William signed the next page as well, on 15 November 1885. Rozilla Cobb, signed at Bryantville, Massachusetts, on 8 January 1884. Perhaps Rozilla (Ford) Cobb, born 1812 at Pembroke, Massachusetts; she was the wife of Joseph Cobb. Appears to be the handwriting of an elderly person. Arthur L. Everson of Braintree, Massachusetts. Another person who used pointillism like Walter Everson. I'm not sure of his last name or Braintree. H. Waldo Foster, signed at Pembroke, Massachusetts in 1879. Perhaps the son of the previous signer, Emma, who described herself as Adella's cousin. They signed facing pages with what appears to be the same pen. Emma, signed 7 December 1879; Sarah Adella Lapham's cousin. Perhaps the mother of the signer on the facing page, H. Waldo Foster. It appears they used the same pen. Rusha P. Josselyn, signed at Hanson, Massachusetts on 29 March 1879. She was Rusha Phillips (Eells) Josselyn, wife of Benjamin Josselyn, who had died earlier, in 1870. 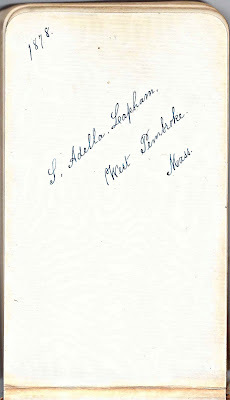 Elbridge W. Lapham of Chelsea, Massachusetts, signed 31 December, 1882. His father Oliver Lapham was older brother of Sarah Adella Lapham's father Samuel Lapham. Angeline Morton of Randolph, Massachusetts, signed 18 October 1879. 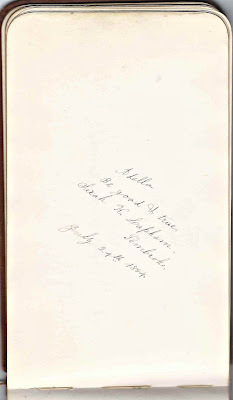 Wife of Frank Morton and mother of Addie F. Morton who signed the facing page. Addie F. Morton of Randolph, Massachusetts. 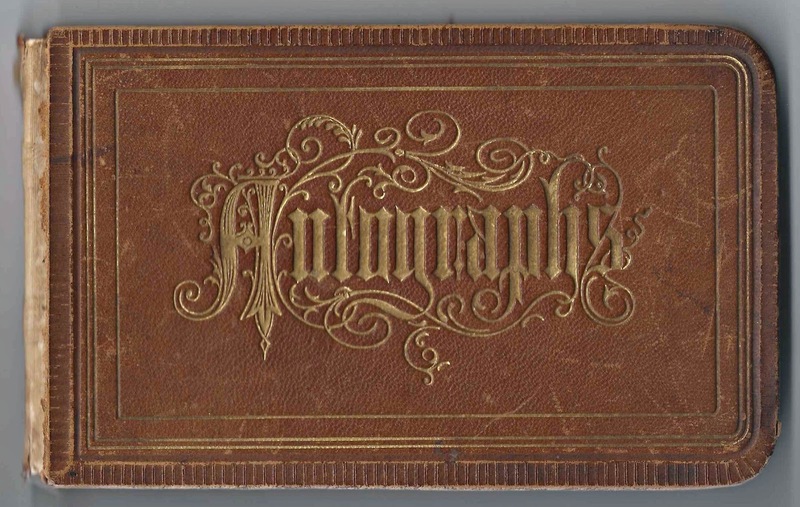 Daughter of Angeline Morton, who signed the facing page. Gustavus Percival of Hanson, Massachusetts, signed 29 March 1879. 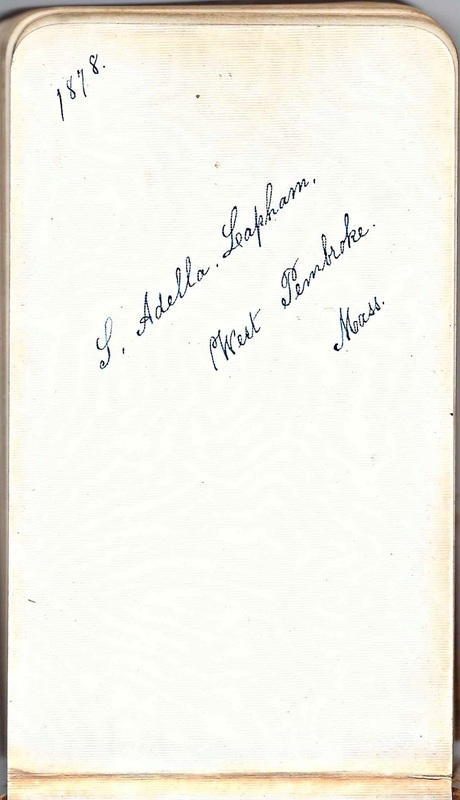 His wife Maria Josephine (Josselyn) Percival signed the facing page. M. Josephine Percival, signed in 1879. She was Maria Josephine (Josselyn) Percival, wife of Gustavus Percival, who signed the facing page.